How do I get out of the woods? Don’t ask Siri. This past weekend I spent a couple of very nice days on a creative retreat with some lovely people. We stayed in a cabin on top of a little hill surrounded by beautiful woods. There were hiking trails, lakes, and critters of all sorts ( bears?). I went on a hike. Yes, I did. In the woods. See? Me, in the woods, looking happy ( despite the possibility of bears). Eight of us set out with our cameras to capture the evening light, the “golden hour”. At some point, four of us took a right turn around the lake. We assumed the other four were behind us. We walked uphill. We walked downhill. We walked (mostly uphill) until we came to a road. We turned onto the road, walking ( uphill again!) until we came to a gate. A happy little green gate which happened to be closed and locked. The only way to the other side of the road was around or over that gate. 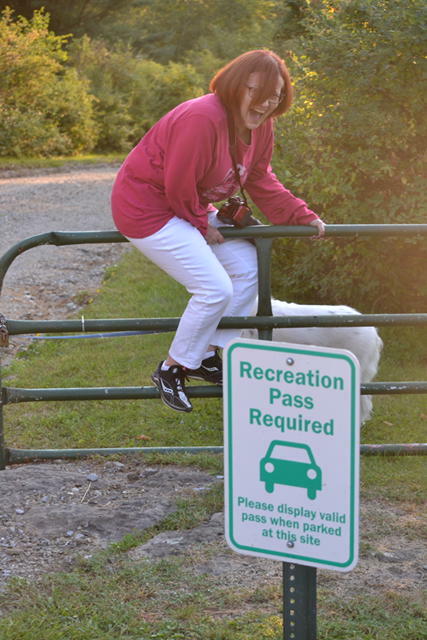 I wasn’t going around ( too many extra steps and high vegetation, maybe bears), so I went over…..almost. One leg went over, but the other refused to cooperate. I was stuck. On a gate. In the woods (where there are always bears). Eventually, I managed to convince my left leg to join my right, and we continued on our way. Intellectually, I understood that my friend Beth knew exactly where we were and that we were going in the right direction. I, however, did not have a clue and the “holy hell I’m in the woods and a bear is going to eat me!” control freak part of me wanted to, so I did what any tech-savvy human would do: I pulled out my iPhone, and I asked Siri. She would rather not tell me how to find my way out of the woods. Siri was obviously in cahoots with the bears. But, thanks to Beth and her awesome orienteering skills and after walking uphill another two zillion miles, we made it back to camp. As we opened the door, there sat the other four hikers, happily enjoying a beverage and not looking sweaty, tired, or bear eaten at all. Hmmph. Probably all have Android phones with personal assistants who don’t make deals with bears. It was a great couple of days. Nobody saw a bear ( probably because there aren’t any in that area) and I didn’t get eaten by a bunny or a fawn. But next year, when we go to Yellowstone, I’m getting a new phone. 1 Response to How do I get out of the woods? Don’t ask Siri.